MMAN (JT) — Her Majesty Queen Rania on Wednesday said the concept of higher education needs to be redefined to include academic, developmental and social aspects. Cairo, March 29 (Petra) -- Her Majesty Queen Rania Al Abdullah on Wednesday emphasized that the open higher learning concept needs a definition plan linked with social, developmental, and academic dimension,. 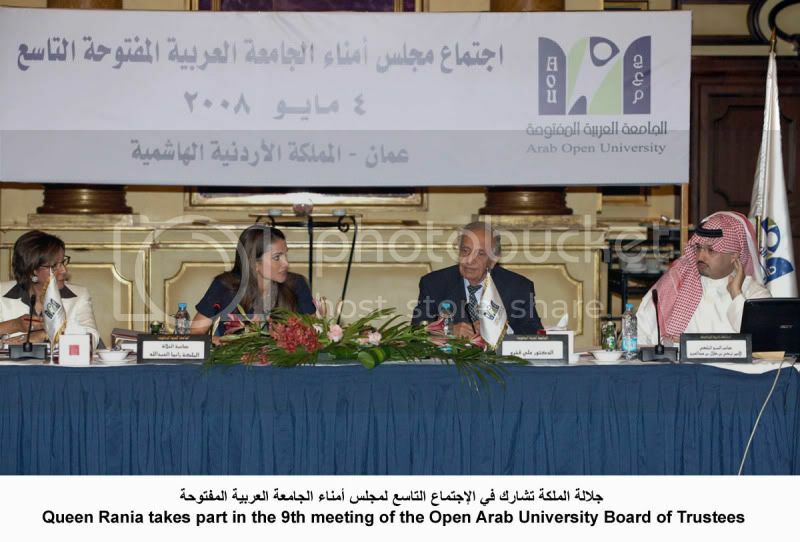 Queen Rania's remarks made during a meting for the Arab Open University (AOU) board of trustees held on today in Cairo. The meeting was chaired by Prince Talal Bin Abdul Aziz Chairman of the Boar of Trustees. (Jordan Times - Amman) Their Majesties King Abdullah and Queen Rania on Tuesday received Saudi Prince Talal Ben Abdul Aziz, president of the Arab Gulf Programme for United Nations Development Organisation (AGFUND) and co-chair of the Arab Open University (AOU) board of trustees, the Jordan News Agency, Petra, reported. I am studay in Arab open universety and until now I am not sure what is the role Queen Rania play in my universety . some times I think she is there because of prince Talal , I don't think the student in arab universiety know what is her role but in another hand we all know what is the role of prince Talal because he is the founder of the universtity , he appeared several times on the TV to talk about the gols of arab open unviersity etc .... , some articles describe Queen Rania as one of the curators but what is curators I am not sure . yes I realize that she one of the Trustees of the arab open unviersity ( what ever that mean ) , but what is the role of ( trustee ) ? In these photos about arab open univercity QR seems extremely beautiful, how can a woman be beautiful every day with so many travels she does? Unbelievable woman. Also she seems to be very calm and satisfied, to have real peace in mind, that's what I admire about QR. I think that characteristic of her personality make her so famous. It may be because she has many children and because she makes sports (jogging). "...Amman, June 26 (Petra)-- Two steadfast advocates for promoting educational opportunities, Her Majesty Queen Rania Al Abdullah and His Royal Highness Prince Talal Ben Abdul Aziz, joined forces, Tuesday, to lay the cornerstone for the Arab Open University's campus in Jordan. The real wealth of this university is its 'openness' to new technology, to new learning methodologies, and most importantly, to those seeking knowledge – the young man in a rural area too far from a university town, to a working mother who still wants to learn after she puts her children to bed at night, to a retiree who hasn’t quenched his thirst for learning and still has a lot to offer society," said the Queen...."
The working relationship between Queen Rania and Prince Talal goes back several years. They’ve worked together on micro-credit intiatives, including the launch of the National Microfinance Bank (see article below) in Amman last year, the first institution of its kind in the Arab world. In November of last year, Prince Talal, along with Queen Rania, took part in a meeting of the board of trustees of the Arab Open University. This is his follow-up visit, to lay a cornerstone for the university's campus in Jordan. AMMAN (JT) - Her Majesty Queen Rania on Sunday took part in the 9th meeting of the Arab Open University (AOU) board of trustees, where participants discussed several issues including the 2008-2012 AOU strategy and its scientific research plans. Saudi Prince Talal bin Abdul Aziz (R) and Queen Rania of Jordan (2nd R) attend the opening ceremony of the Arab Open University, Jordan branch, in Amman on February 24, 2010. Quite the turnout at the event, aside from Saudi Princes Talal bin Abdul Aziz and Alwaleed bin Talal, Prince Ra'ad and Jordanian Prime Minister Samir Rifai were also in attendance. Queen Rania, co-chair of AOU’s board of trustees, along with its chairman Prince Talal, unveiled a plaque next to the new building, which has been equipped with the latest technology to boost services, according to a statement from Her Majesty’s office. Queen Rania arrived in Cairo today for the Arab open University meeting. Cairo, Dec. 18 (Petra) --Her Majesty Queen Rania Al Abdullah, co-chair of the Arab Open University (AOU) chaired the 20th meeting of its board of trustees held today in Cairo.